Everything you need to know about visiting the Empire State Building (350 Fifth Ave, NY 10118). Although it’s no longer the tallest building in New York City, this world-famous landmark remains a Manhattan icon for good reason. The main deck on the 86th floor is the highest open-air observatory in NYC, offering stunning 360-degree views of the Hudson and East Rivers, the Brooklyn Bridge, the Statue of Liberty and more ($34, seniors $31, children $27). Famous faces such as Chrissy Teigen, Celine Dion and Neil Patrick Harris have all been spotted enjoying the views from the top, which you’ll recognize from countless movies and TV shows. If you can’t get high enough, head to the 102nd floor's indoor observation deck for a full view of Central Park ($54, seniors $51, children $47). The Dare to Dream exhibit on the 80th floor honors the 3,400 people who built the 1,454-foot skyscraper and features original photographs, architectural sketches and construction notes. Before visiting, download the ESB app on iTunes or Google Play for exclusive content and access to a free audio tour. The best time to visit with shorter lines is between 8 and 11am. If you’ve got no time at all for lines, nab an Express Pass ($60 for main deck, $80 for both decks), which will allow you to skip past everyone. But take note: The Express Pass is strictly sold online, so don’t be fooled by any people peddling them on the street. What better place to catch a sunrise than the Empire State Building? For $100, you can watch the sun come up over the entire city, and yes, it's stunning. This experience is limited to only 100 guests each day, so be sure to book yours well in advance. The views are just as spectacular at night, which you can enjoy if you opt for the AM/PM Experience ($49, $39 for children). The night ticket is redeemable after 9pm. Since 1976, the tower’s lights have been changing colors to honor holidays, special occasions and different organizations. But in 2012, an LED light system was installed, giving off dazzling displays of 16 million colors. Check the lighting calendar to find out what the colors signify every day. Also, light shows are now staged to simultaneous music on iHeartMedia stations. Want to watch? Search “Empire State Building Light Shows” on YouTube and prepare to be amazed. Our New York editorial team is constantly updating and reviewing the best attractions, activities and venues across the city, so that you're always in the know, with the best of NYC. at your fingertips. Empire State Building was most recently updated with new tips on June 21, 2017. $32, seniors and military personnel with ID $29, children 6–12 $26, children under 6 and military personnel in uniform free. I've always wanted to go up the Empire State Building when visiting NYC! I wasn't disappointed, despite the advice to go up the Rock instead! The building itself was the best part – ornate art deco influences everywhere and different floors made it hard to know where to look first! They had an exhibition about the building when I visited, which leads you into the view itself. When you get there, try to restrain yourself from singing Jay Z's Empire State of Mind (has to be done.) A must-do experience! *Entrance was included with the NYC Pass, which we found invaluable, saving time and dollars! Amazing view over the city in a 360º angle. Such a great experience visit this iconic attraction. What most people does is to go between the afternoon and night, and it really worth it. By day you can see everything - persons, taxis, the smoke from the metro. At night, you can see a spectacle of lights all over the place - from the rooftops until de Times Square. Unmissable! The first thing I wanted to do as a tourist from London was to visit the Empire State Building, and boy it did not disappoint! My friend and I visited in the evening, almost at midnight when there were no long queues and just breathtaking views! It was one of the most memorable moments of our trip, seeing the beautiful New York skyline all lit up felt so surreal! A real moment of self reflection and admiration of the city. Simply stunning and a must for anyone visiting the big apple! I actually work in the ESB so I'm a little biased but I will say this is a great building. If you're going to come here for a tour or what have you try and come on not a perfect day - only because the lines can be horrendous (I've seen it before, it's pretty bad). Try and sneak a peak around the lobby (although the security guards are pretty strict about keeping tourists in the front of the building). Definitely walk a few blocks north or south in order to get the ideal picture since the building is so tall if you're right up on it you won't get the best shot. This iconic building truly is the heart and soul of New York City. A symbol of The Empire State, The Concrete Jungle, The Big Apple. The Empire State Building is a tower of shimmering ever changing lights that makes the New York City skyline as breathtaking and recognizable as it is. No first time visit to Manhattan would be complete without a ride up to the amazing 102nd floor observation deck for unparalleled views of the city. 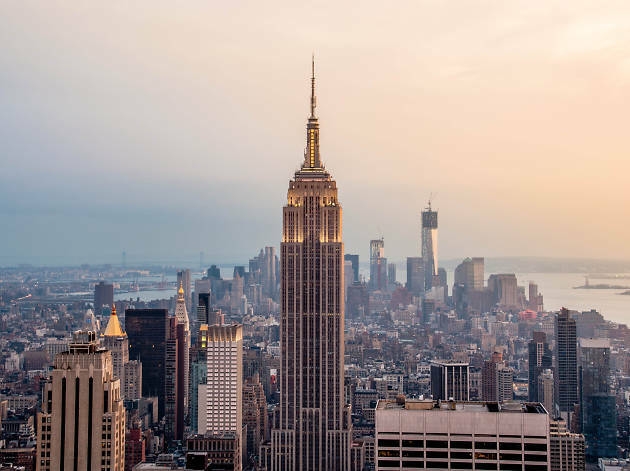 Though there are plenty of trendy places to visit in this great city, the Empire State Building offers a piece of history, a symbol of stability in this vast changing metropolis, and an unforgettable experience. Empire State Building is part of NYC history. Representing the marvel that is the modern sky scraper, the architecture, business and culture of the times are on display for all to see. Busy part of a notoriously busy city, there are tour guides, bus tours, and general tourist traps everywhere around here. This is one of them. Wait on line, buy a ticket to board an elevator. Wait on another line for another elevator. Gift shop. Gift shop. Observation deck! Selfie. Selfie. Wait on line to get back on elevator. Overall it's one of those things that you do once, then you're like "Sorry, I already checked it off my list..." The art deco style is really interesting. The staff is polite. Most everything is pretty well cleaned. I've come here for some business meetings and getting checked in and through security you also get to wait on line. It's okay though, it builds character and helps build suspense. In a kind of good way. A tourist favorite located on 33rd street, I still enjoy bringing visitors to see this iconic building. From the art deco interior to the excitement of flying up the elevators. The views are naturally amazing on clear weather days. I have been there on overcast days and its quite unique as clouds will hover below you and you look down. Tons of history of the building and the city can be found throughout. The lights that surround the top of the building have been more complex over the last few years and there have been images projected on the building on some evenings as well. Tours are given and there are headsets for multiple languages as well, with the exception of German, for whatever reason. One of the most iconic buildings in the world, the Empire State Building is the emblem of New York City. Built in an amazing 18 months during the depths of the Great Depression, it is the epitome of the skyscraper. The views from the top are spectacular, although as many have noted, ESB isn't part of the view! No matter; you can also climb to the Top of the Rock at Rockefeller Center. Both are time-consuming and pricey, but well worth it. The Art Deco lobbies of ESB are less impressive than Rock Center, but are still awesome. Interesting trivia: ESB was originally designed with a flat roof, like Rock Center; the glorious stainless-steel apex we see was added to provide a landing platform for a dirigible, which proved to be an impossible idea, and the finial spire was added for television transmission before most people had TVs. As mentioned by others, the view from the top of the ESB almost doesn't feel as iconic as you might expect, because you're viewing the skyline without the ESB in it. And the lines, omg. First the line just to get up to the 2nd floor, then the line to go thru security, then another line winding around the 2nd floor to get to the elevators, then once you get in the elevator there's a line on the 80th floor to go up to the 86th floor. Lines just to get into more lines. Luckily I was with someone who works in the building, so we got to skip thru the 2nd floor. But I would advise tourists that it is ultimately NOT worth the wait (and definitely not worth paying for an express pass to skip) - get your view from somewhere else! This is probably blasphemous, but I find the Empire State Building a little overrated. 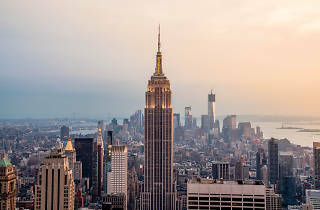 It is expensive and overcrowded, and at the top, you miss seeing the Empire State Building as part of the skyline because you’re standing on it! The trick is to go to Top of the Rock at Rockefeller Center to see the view – then you get the iconic Empire State Building in view. The Empire State Building is a must visit when coming to New York but to be honest, the view from Top of the Rock is better because you can see ESB. Like any tourist attraction, the lines are longer during peak tourist season and there isn't much to keep you entertained as you go up (like One World). If you are having to choose between the two, I would recommend Top of the Rock but if you are wanting that "iconic movie" moment in New York, choose ESB. Surely on the to do list of anyone venturing to New York for the first time - it's worth revisting too for the regular visitor, although The Rockerfellar building runs it close in terms of view of the NY skyline. Particularly impressive at night. Go to the top! You won't regret it! this may be cliche, but viewing New York City from this height is just something you must do. It's a perspective of NYC that you just have to see. Also, I recommend going just before sunset so that you can see the city go from day to night. It's gorgeous. Also, I paid extra for a ticket that allowed me to skip all the lines during rush hour, which I thought was worth it. But I bet there's a time you can go when it's not as crowded and you needn't spend so much.